UK Theatre has announced the 12 regional and national winners of the UK's Most Welcoming Theatre 2017 in association with Smooth Radio. The Alhambra Theatre in Bradford has been voted as winner for Yorkshire and The Humber. This award, which is voted for by the public, is an opportunity for audiences to celebrate their local theatre. This year, over 172 theatres competed for the coveted title and more than 40,000 votes were cast – more than in any other year. All the regional and national winners will be invited to the UK Theatre Awards on Sunday 15 October where the overall winner will be announced. In 2016, the overall winner was The Mill at Sonning. The annual UK Theatre Awards take place at London’s Guildhall, where the ceremony will be hosted by Sharon D Clarke. 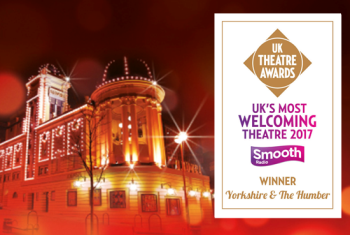 "We’re extremely proud that the general public have voted for the Alhambra Theatre in Bradford as the most welcoming theatre in Yorkshire and The Humber - what a great honour it is. We aim to make a visit to the Alhambra Theatre as memorable and enjoyable as possible; to put it quite simply we care about our customers’ experience and love to extend our warm Yorkshire hospitality to everyone who walks through our doors.